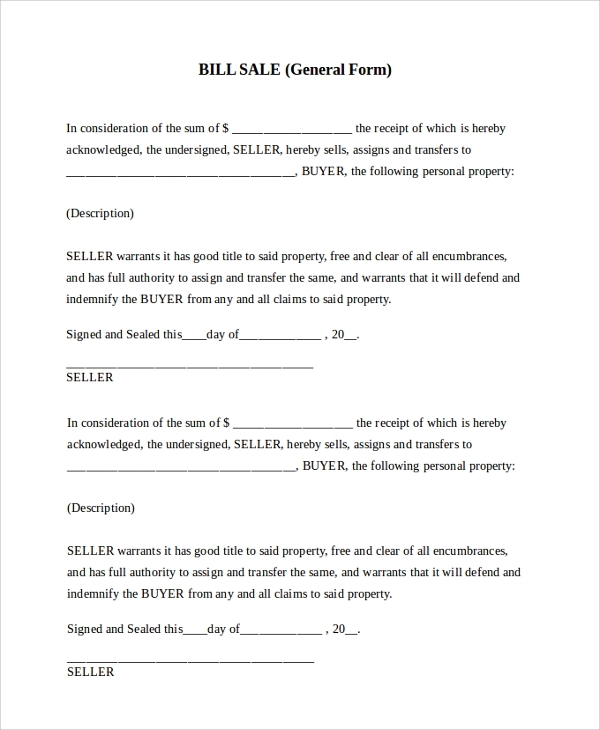 Every buying and selling transaction requires a bill of sale which proves the ownership as well as provides the warranty and certain terms and conditions. 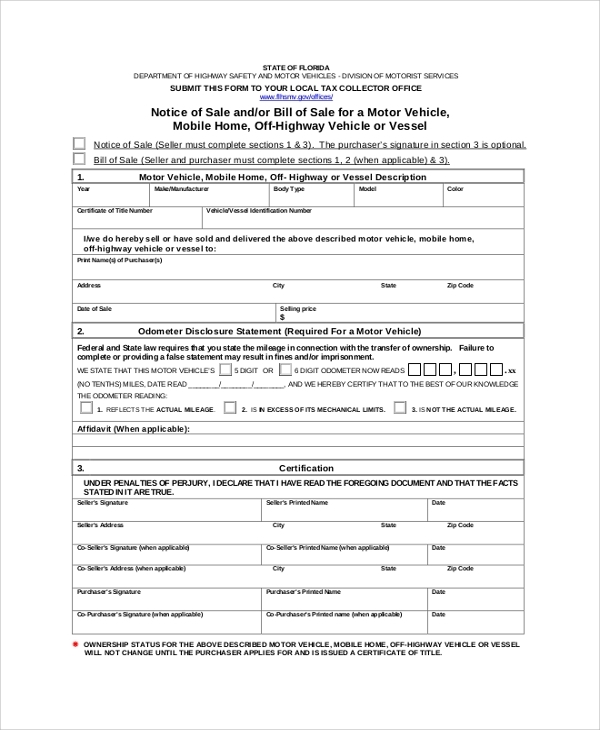 The following blank Bill of Sale Samples have all the provisions to sell motor vehicles, vessels, trailers and many general items effortlessly. Some of them are printable and need to be filled manually while others are readymade and can be printed. Some of them also have provision to write terms and conditions if needed. 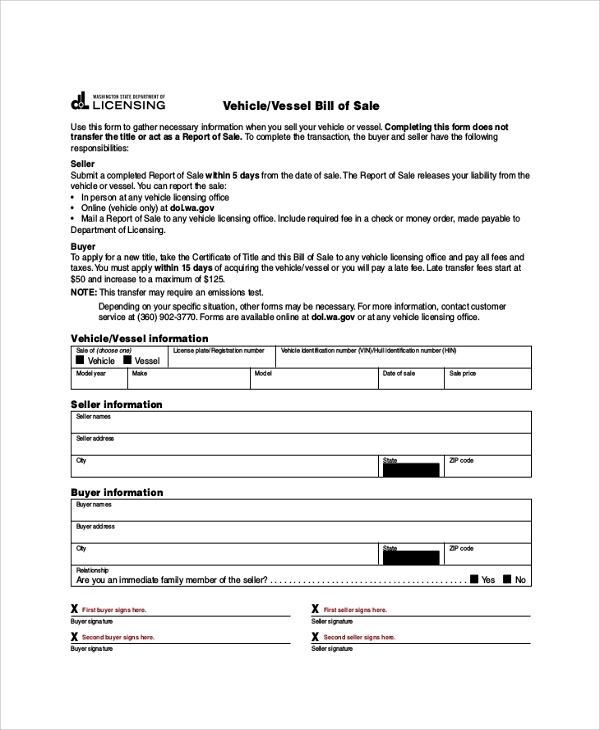 This is a perfect motor Vehicle Bill of Sale Templates. It is printable, clean and structured. It contains sections for the seller’s and buyer’s information, description of the vehicle, disclosure and warranty, payment and signature. This is a complete bill of sale for selling the vessel. 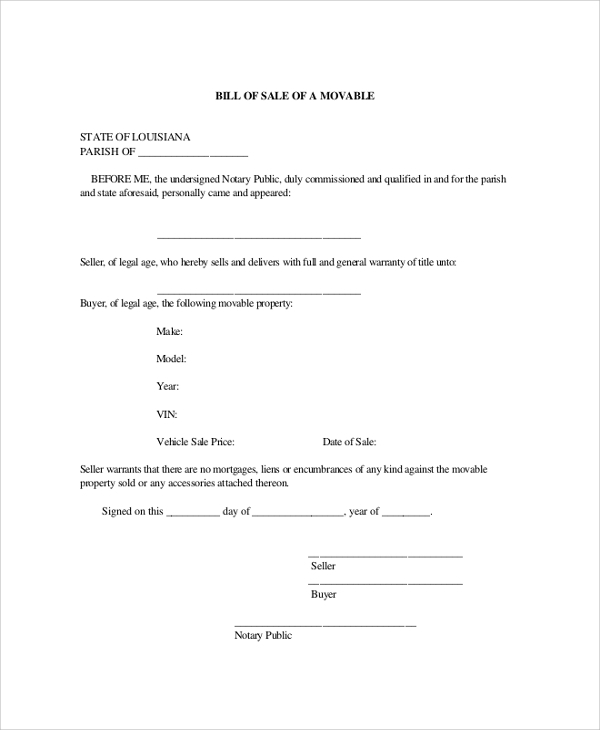 It contains a few statements for the seller and the buyer followed by the vessel information, seller information, buyer information, and it can be filled and taken as printout after that. 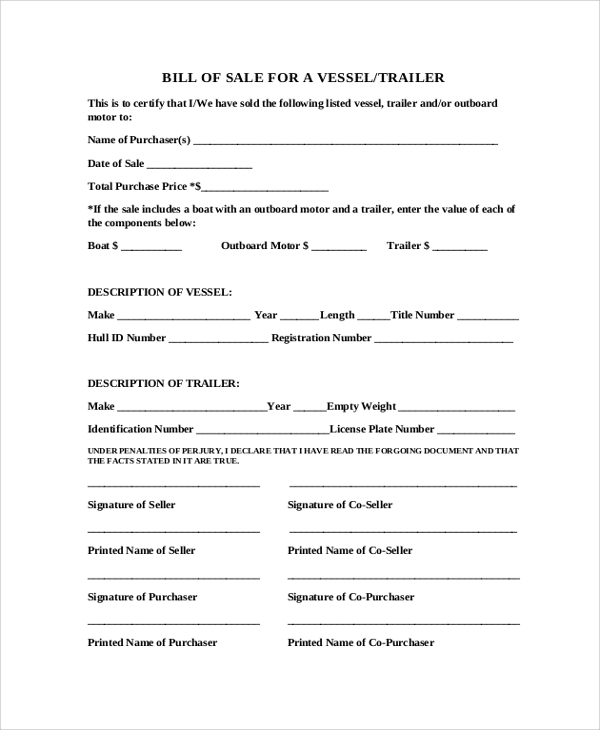 This is a blank bill of sale of a trailer, vessel, and outboard motor. It contains fields for the purchaser’s details, description of the trailer or vessel and spaces for the signature of the buyer and any other co-purchasers in a case of a partnership. It is mandatory to provide a bill of sale for any product or items sold which involve the transfer of ownership and monetary transactions. Different types of items require various types of ready-made blank bill of sale. 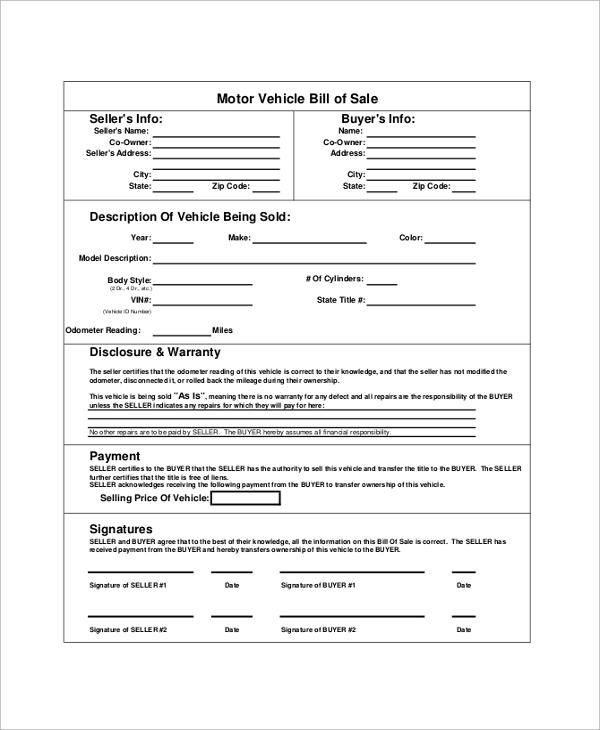 The above-listed Bill of Sale in PDF templates can be used for motor vehicles of all kinds and even for general items. The templates are perfect and well-organized, and all of them are printable, and some of them are fillable on a computer. 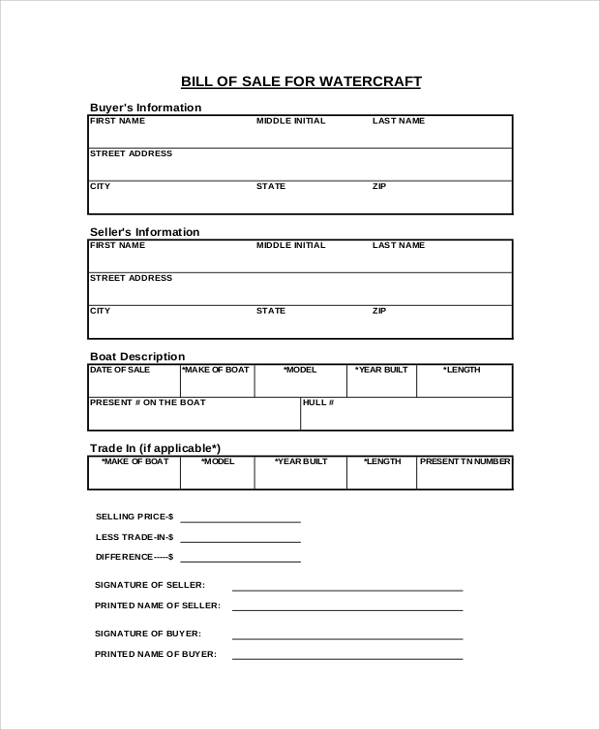 This is an organized bill of sale template for selling a watercraft of any kind. It is well structured and has provisions for buyer’s information, seller’s information, boat description, trade in, transaction details and other necessities. 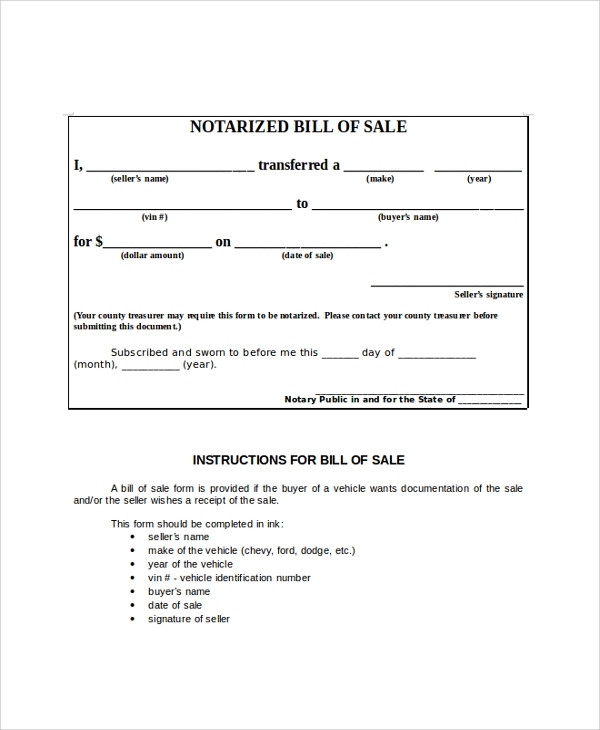 This is a blank Bill of Sale Form for selling boats. 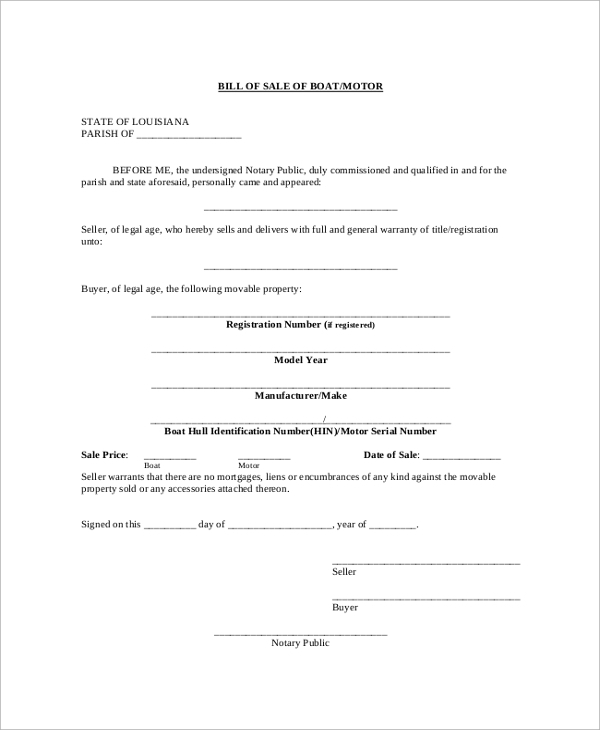 It is a legal document, and it needs to be signed by the notary officer to make the sale official and legal. It has provisions to write the description of the boat sold, purchaser and sellers details. The targeted audiences for the blank bill of sale are all the sellers who are selling any generic product or item that involves a monetary transaction. Most of the above-mentioned Bill of Sale Samples are tailor-made for the motor vehicle sellers. They are required by the big outlets to small business owners. Some of them contain provisions for warranty and areas for writing terms and conditions. The above-listed Bill of Sale Samples is perfect, clean and well-structured. They are the legal documents that the seller must produce to the buyer to make the transaction legal and it also proves the ownership of the product for the buyers. In the case of mishap, such document will help to claim insurance. They are a must for the seller to make the billing process transparent and super fast.